I know this blog is full of recipes that people might feel guilty about eating. Just remember it’s all about enjoying life and being healthy and happy! I’m not healthy unless I get in some homemade treats now and then. To balance that out, I tend to cook on the light side and we rarely eat out. I sometimes have lots of time to prepare detailed meals, but mostly I’m tired and just want supper to be ready in less than an hour (or less that 15 minutes…). I’m a quick cook, aka impatient, so I tend to cut down on prep work and find ways around things like thawing and multiple bowls. The microwave is my best friend! 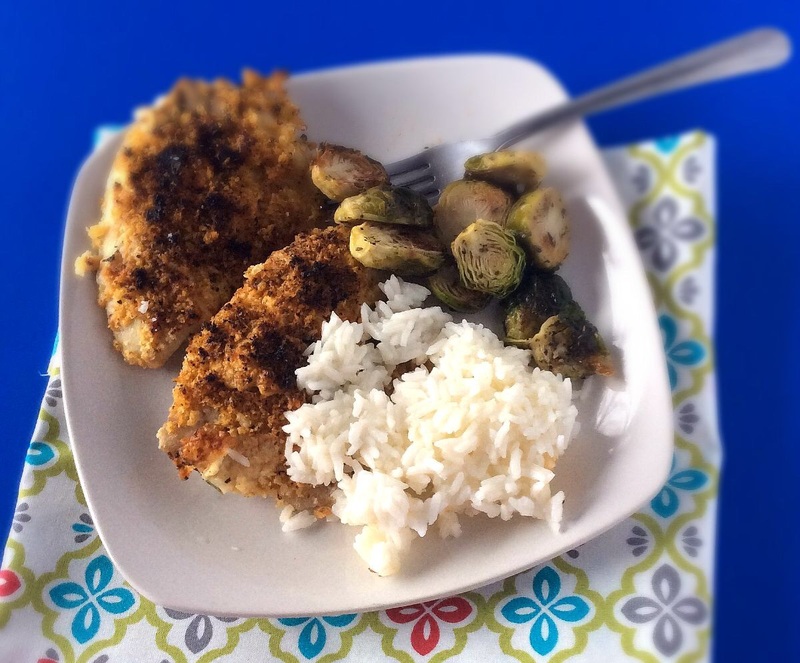 I wanted to start a series for weeknight meal ideas to share with you. I cook for myself and my husband but we always have leftovers, so these recipes should feed a family of four with no leftovers. To view these recipes by themselves, just click on the meal category below the posts. Hopefully this series will serve as some inspiration to cook easy, healthy, light meals for you and yours! 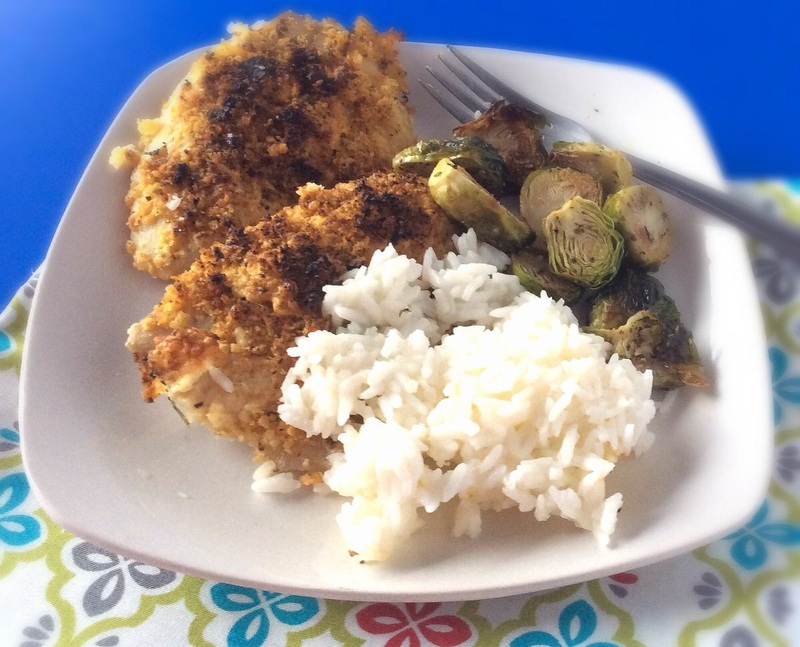 This tilapia is fast, has a nice crunch, and the spice mix is perfect for any fish or chicken! The brussels sprouts are very tender and addicting. I made some rice in my rice maker to go with this meal, so everything was done in about 30 minutes. Line a baking sheet with a silpat or parchment paper. Preheat oven to 350 F. Place fillets on baking sheet. Season fillets with salt and pepper. Bake for 10 minutes. Meanwhile, in a medium sized bowl, mix all the dry ingredients together. Mix melted butter and mayonnaise together. When fish is removed from oven, switch oven to ‘broil’. Brush the fish with the melted butter mixture. Top with some of the breadcrumb mixture, pressing it gently into the fish. Broil on low for 5 minutes or until golden. Preheat oven to 400°F. Toss Brussels sprouts with oil, salt and spices on a baking sheet and roast for 30-35 min. Stir once or twice, until deep golden brown, crisp outside and tender inside. Transfer to a bowl and serve.